Mens Make Up: The Next Step in Male Grooming? Look out girls, beauty just might be on its way to becoming a mans game. Away from the high street, designers have begun to expand into male friendly cosmetics. First came Marc Jacobs, introducing a trio of unisex products into his ‘Boy Tested, Girl Approved’ line (lip balm, brow tamer and concealer respectively) now followed by designer Tom Ford, who announced earlier in the year plans to launch a line of beauty products catered exclusively towards men. It will be a nine piece line of multifunctional skin care and grooming products, including a face cleanser, moisturisers, eye treatment, purifying mud mask, concealer and bronzing gel. In parts there appears to be little out of the ordinary in Fords line. Facial cleaners, moisturisers and eye treatments have dominated the male grooming market for years, with fresh ideas continuing to emerge as to just what magical ingredient will change our skin for the better. The concealer and the bronzing gel however, may be the cause for a few raised brows. After all, men don’t covet concealer and bronzing gel, do we? He is also an advocate using bronzer, openly discussing the secrets of his tanned complexion- a bit of bronzer on the forehead, nose and cheekbones. It seems natural that Ford, at the centre of an industry that intends to look good, would be inclined to pick up a spot of concealer in the pursuit of perfection. The question is, is there room in the average Joe’s cabinet for products more traditionally linked to women? Men have become more inclined to be concerned about the visual. 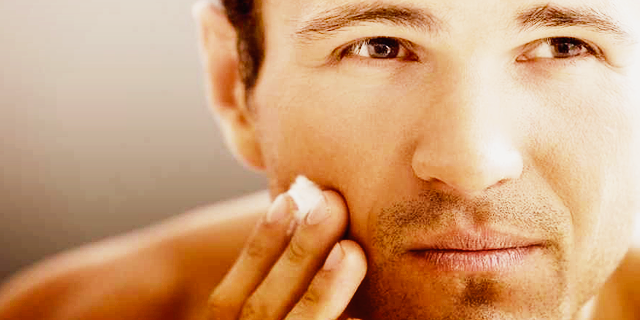 The age of soap and warm water long ago found itself replaced by various products that now form a mans daily routine. We now find ourselves drawn to products that promise a reduction in ‘oily shine’ by using a ‘matte effect’, or creams that promise a reduction of ‘tired eyes’. What began as a launch of a few simpler products constantly finds itself expanding into more specialised products- often reminiscent of more female-orientated counterparts- so is make up the natural next step? Where a stigma may exist here for mans use of make up, overseas is a different case. Whilst western cosmetics have only recently discovered the BB Cream, Asian markets have used the creams for some time- and have lines exclusively tailored for men. Putting men and make up in the same sentence might be natural cause for alarm. It’s not difficult to imagine the vision of Friends Joey Tribiani puckering up to advertise ‘Ichiban- lipstick for men’. However if the emergence of men’s make up products manages to trickle down from high end brands down towards the everyday consumer then have relief- designers aren’t looking to encourage us to put on a bit of lippy. The intention is to cash in on women’s most obvious secret- the trick to achieving that ‘I’ve had more than three hours sleep’ glow that secretly, admitted or not, we all envy when we’re walking down the street looking like we’ve just crawled out of a bin. The question is- are men ever going to confidently brave brandishing concealer and bronzer? Or, like Tom Ford suggests, have most of us have been stealing the secret for ourselves for quite some time? Do celebrities help to cause addiction to junk food? A season abroad – Not just a long holiday!